Any quilt that is marked SOLD can be reproduced on request. 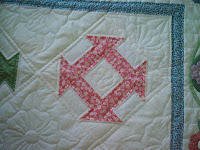 Please email the quilter for information. 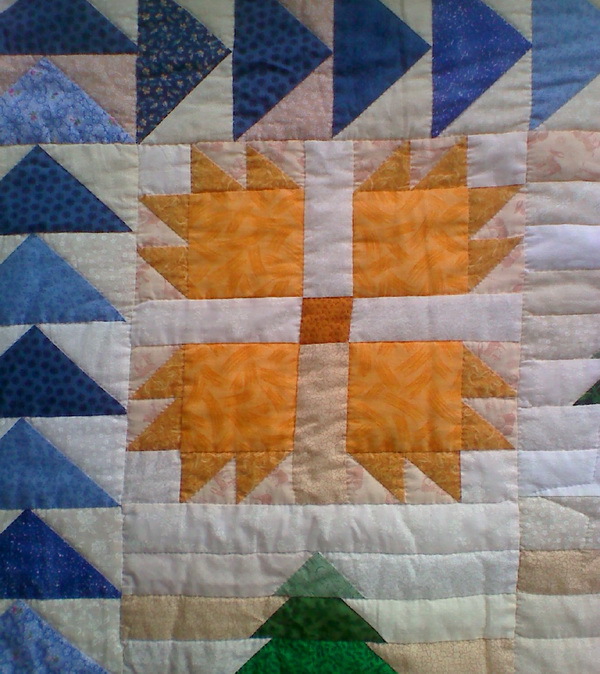 Every quilt is hand quilted. If there is appliqué, that is done by hand as well. Churn Dash in 1930's reproduction prints on white backgrounds. 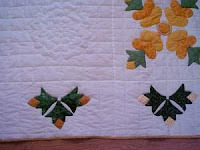 Each block is made from a different print with flowers appliqued to the border. 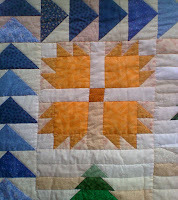 The blocks are machine pieced, border is hand appliqued. 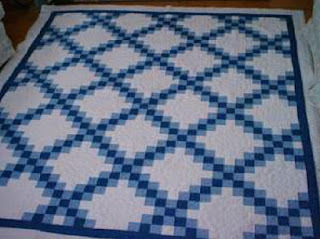 The entire quilt is hand quilted. It fits a twin/single bed. Bears In The Woods is from Eleanor Burns' Quilt in a Day book by the same name. 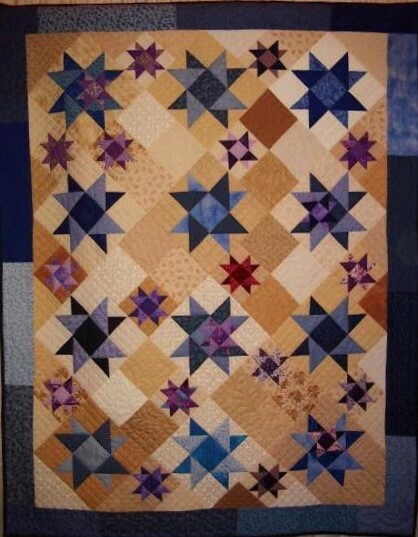 The blocks are machine pieced from scrappy fabrics of each color. 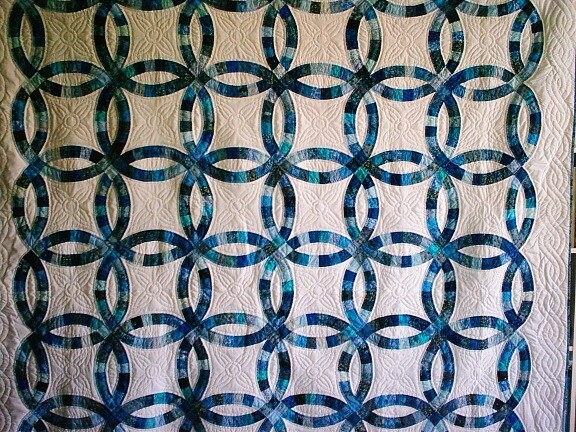 The entire quilt is hand quilted. It fits a queen size bed. 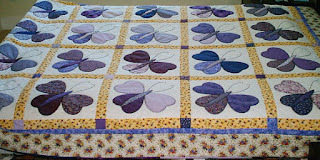 Butterflies is an original design of ScrappyBlue Quilts. 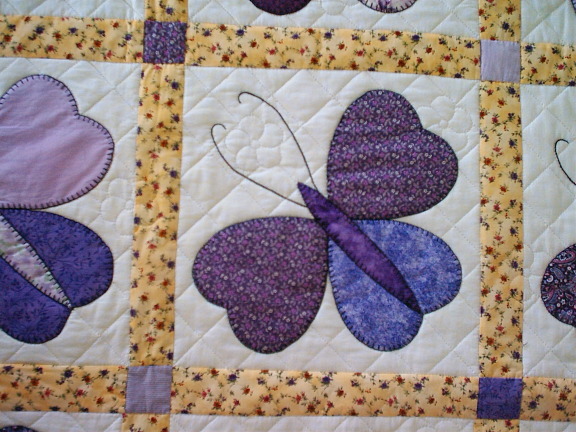 The butterfly wings are made from hearts in various purple prints on a mottled pale yellow background. The outlines of the butterfly bodies and antennae are hand embroidered. The butterflies are hand appliqued, the blocks are then machine pieced. 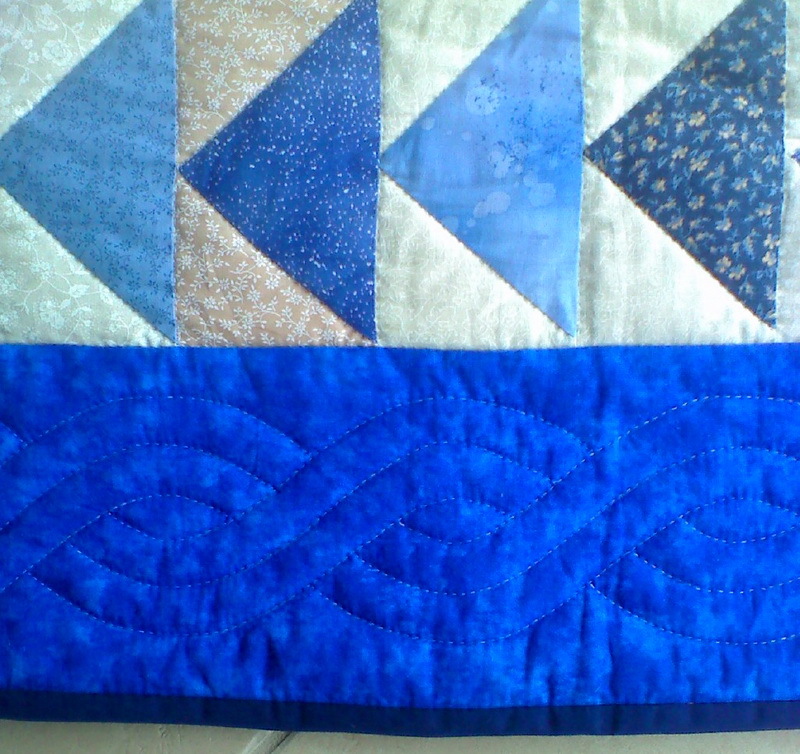 The entire quilt is hand quilted. It fits a twin/single size bed. Wedding Ring Blues is from the traditional Double Wedding Ring pattern. 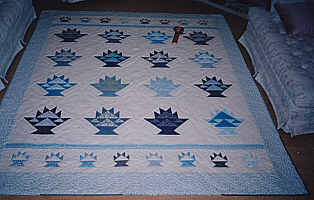 It is a true scrappy blue quilt using many different blue prints on a white background. This quilt is completely made by hand. It fits a Queen size bed. 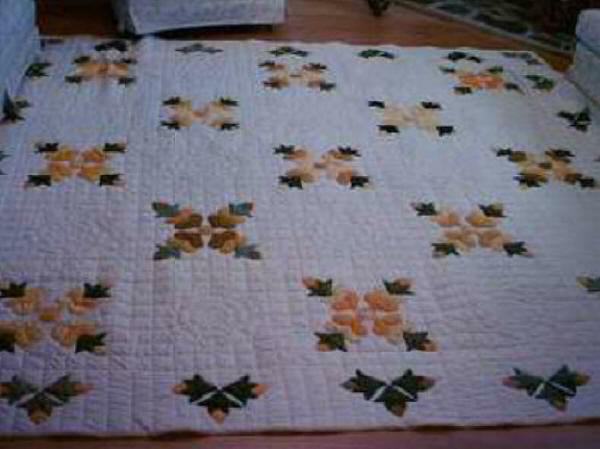 The quilts shown below were either made for my own home or given away as gifts. Any of them can also be recreated for sale on request. 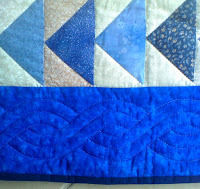 Blue Baskets won a first place ribbon for hand quilting. Queen size. 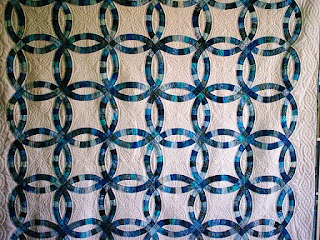 Broken Star in colors ranging from dark green in the center, radiating out to teal in the middle, then to dark blue with variations of light shades of each in between. Double Irish Chain in 2 blue prints on white. Queen Size. 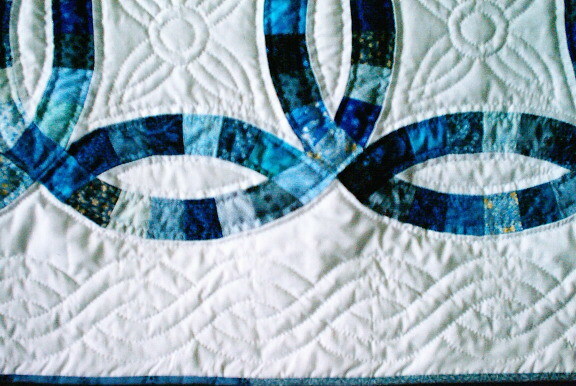 "I Have a Dream" is from the book Cookies & Quilts by Judy Martin. 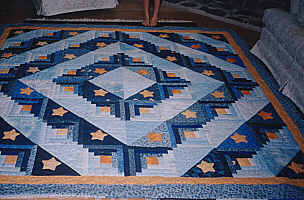 "Sheriff's Log Cabin" is from the book The Simple Joys of Quilting by Joan Hanson and Mary Hickey. It's 92" x 92"
"Yellow Rose of Sharon" is my own design, King size.